Yoga Retreat that is taking place this summer in Italy...the CUISINE. I mean "Eat" is the first word of the title, although, don't get me wrong - yoga is still the focus. But food - beautiful, tasty, healthy, organic Italian cuisine is also a wonderful part of the retreat that guests are sure to enjoy. Amanda, one of the hosts at the villa, is a natural when it comes to preparing simple, seasonal meals in the traditions of the Tuscan and Umbrian regions. I thought today I'd feature a recipe of hers which she’s shared. It's the perfect in-between seasons meal with the warmth of the grilled bread and beans, with the tanginess of the fresh rosemary. First grill your slices of bread. While they are still hot drizzle them with olive oil and rub them with a cut clove of garlic. Pull all the spikey leaves from the rosemary spring and chop very, very finely until almost a powder. Fry one clove of chopped garlic in a little olive oil but be careful not to let it colour. Add the drained beans and continue to cook for about 5 minutes, add the rosemary, a little more oil and season well with salt and pepper and a spritz of balsamic vinegar. Mash everything together using the back of a wooden spoon until you have a coarse puree. 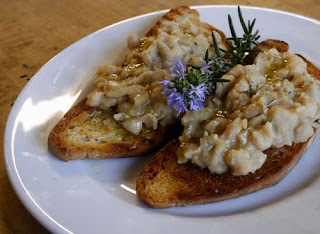 Heap the beans onto the grilled bread and drizzle with more of the olive oil. This is delicious with a sharp green salad on the side and a glass of rough red wine to wash it down.